i just finished a complete awlgrip paint job on #4256. i just felt like showing off a bit! i'm sure painting has already been discussed in detail on here, but if anyone would like a write up, i'd be happy to do it. no, it's not my boat. 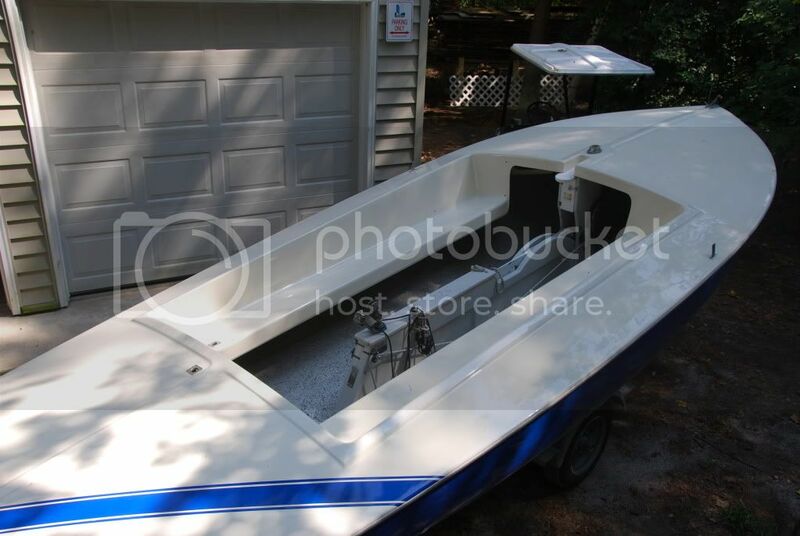 i did it as a side job for the owner of the boat with whom i race it. 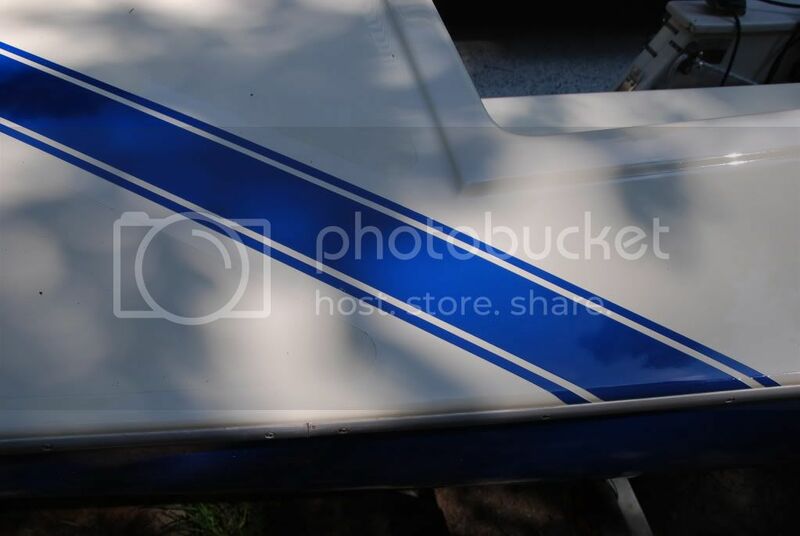 it was actually my first paint job on a boat, and second paint job total, with the first being my '78 midget :) i had a hard time getting the pictures to show up so let me know if you can't see them and i'll just post links. Submitted by KasbeKZ on Wed, 09/16/2009 - 19:24.
forgot to mention: looking at the picture of the stripe, you see some extra tape lines around. i used sprayed on non skid in the form of a powdery additive in the awlgrip. 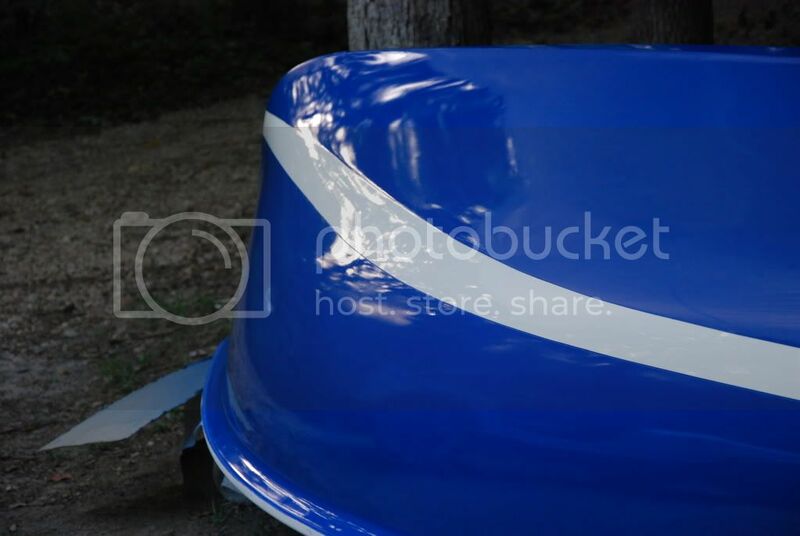 i just felt like mentioning that so it didn't make the boat look bad because the pictures don't really make it clear as to what the line seen is. it did turn out pretty well. i sprayed it outside with a very temporary plastic tent being constructed for each spraying. Submitted by SavageViews on Wed, 09/16/2009 - 21:56. Nice work! I painted #338 with Interlux Brightsides (one-part) this summer and am satisfied with the results, but it doesn't come close to what you've got there. I think my primer coat detracted from the final product. I rolled the high-build primer, and sprayed the finish. Did you use a primer coat? How did you apply it? That non-skid looks great. Submitted by KasbeKZ on Thu, 09/17/2009 - 09:07.
i did use primer. awlgrip won't really stick to anything except a primer from it's system. meaning, you have to use 545 with any awlgrip job, then there are other high build primers that they offer to put between 545 and awlgrip top coat. i sprayed everything. even if you rolled primer, it would still be greatly beneficial to sand it with a long block without breaking through before spraying the final. how is the interlux holding up? i constantly have people asking me what i think of it but i've never used it or heard any first hand reviews from owners. thanks for the compliments! Submitted by SavageViews on Thu, 09/17/2009 - 12:53. Submitted by KasbeKZ on Thu, 09/17/2009 - 12:57.
if i might offer some advise to your past situation if it's worth anything: 80-100 is very course for primer. the theory here is to sand very well before you prime with the long block. with everything fared, you can long block the primer with 120 and not worry about breaking through very much. paint shouldn't usually go on top of anything more course than 220, and not much finer than 440 or so. Is using VC Performance acceptable under class rules? Submitted by David Lochner on Thu, 09/17/2009 - 13:03. Submitted by KasbeKZ on Thu, 09/17/2009 - 13:09.
that's a good question. i don't know. it might be worth it's own thread if you're thinking about using it. i don't expect many people will be coming through this one. Submitted by SavageViews on Thu, 09/17/2009 - 16:46. VC Performance is legal because it is a coating designed to last more than one season: 28. Any bottom coating which is represented by the manufacturer as designed to last one season is not a "temporary coating" and therefore not prohibited under the provision of S-V-3.